In the Region of the Summer Stars is a new Celtic fantasy from Stephen R. Lawhead, the critically-acclaimed author of the Pendragon Cycle. Ravaged by barbarian Scálda forces, the last hope for Eirlandia lies with the island’s warring tribes. Wrongly cast out of his tribe, Conor, the first-born son of the Celtic king, embarks on a dangerous mission to prove his innocence. What he discovers will change Eirlandia forever. For the Scálda have captured the mystical Fae to use as an ultimate weapon. And Conor’s own people have joined in the invasion. I was ten summers old when the world changed. Twelve more have passed since then, yet I recall the details of that day as if it had happened yesterday and I was still that bare-legged boy. 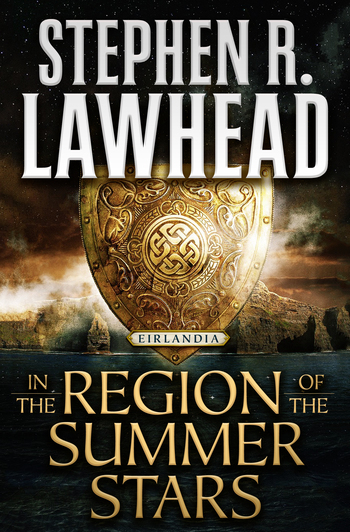 STEPHEN R. LAWHEAD is the internationally acclaimed author of the best-selling Pendragon Cycle, which received critical acclaim for its creative retelling of the Arthur legend and historical credibility. In addition to that series, he is the author of more than 28 novels and numerous children's and non-fiction books of fantasy and imaginative fiction, including the award-winning Song of Albion trilogy. His trademark style of gifted storytelling combined with strong spiritual vision has placed his books among the enduring favorites of fiction. Lawhead makes his home in Oxford, England, with his wife, Alice.